Copyright: Uday Sankar Yerramilli; http://www.ransomforhansum.blogspot.com. Powered by Blogger. This dates back to sometime in April of 2003. After spending a year in hell, I was 18 hours and 550 km. away from heaven. Well, thankfully I survived the torture and was all geared up for my journey home. With the tagline "thalli laanti shikshana, thandri laanti rakshana" (Training like a Mother and Protecting like a Father), Sri Chaitanya Junior College has been one of the most successful institutes in Andhra Pradesh which offers Higher Secondary education coupled with a rigorous coaching for IIT, AIEEE, EAMCET and the likes. Established in Vijayawada, the Educational Capital of Andhra Pradesh, I call this institute successful just because it could mesmerize tons of aspirant students and double the tons of enthusiastic parents and lure them to join their institute. They promise you the best treatment, best of the facilities, best of the faculty, and best of the best in everything and just after you join the boarding school, you realize that 'promises are made to be broken'. I too fell prey to the same post my Class X. For someone like me, who was a quizzing buff and an extra-curricular activities enthusiast at school, this place was really like hell. Getting up at 5 AM, bathing in cold water, get ready for the Study hours by 6 AM, breakfast at 8:30 AM, classes till 1:00 PM followed by study hours till 11:00 PM with a 30 min. break for snacks in the evening and another 30 min break for dinner. An outing once a month was an eyewash. While the inhuman treatment by the hostel wardens, indifferent treatment by the experienced faculty and the helpless junior faculty added nothing significant to our academic intellect, the absence of access to newspaper and television gave our general intellect a whitewash. The cumulative effect of this over a year added to the frustration of all the hostel inmates. This made us feel that hell would have probably been a better place. After a torturous year at the hell-like place and after a horrendous month of writing exams, exams and more exams, I was all excited to go back home. My Class XI exams were done with and I was packing my bags to take a break from hell before I'd be back there again. As I was about to leave the room, the peon came and informed me that the warden wanted to see me. Wondering what it could be about, I went to meet him. My warden normally has the habit of asking people to meet him and then making them wait. As usual, He wasn't there when I went to meet him. So, i waited at his desk hoping that he will be there before I miss my train. Something bright on his desk caught my eye. On closer observation, I was surprised to see a parcel with my name on it. Sitting there, I was curious but my mind was everywhere guessing what could be in it. After a 15 minute long wait, I was frustrated and I just walked away with the parcel. On opening it, there was a beautiful birthday greeting in it from my best friend. It was a pleasant surprise as I hardly celebrated my birthday while at school. However, it intrigued me as 8th January was my birthday and this greeting reached me in April. With my mind flooded with thoughts, I took my bag in one hand and the greeting in the other and walked towards the gate. I met my warden at the gate and he told me that I had received a parcel and that was why he had called me. He asked me to collect it from his desk and explained me that the parcel had travelled across 4 other campuses for quarter of a year before it finally found its destination. I still preserve that greeting, a first and a special gift from my best friend. Both of us have gone a big way in our respective careers, but we still continue to be the same childhood friends that we were. Thanks Ramya, for that awesome gift.. If you wish to see that, Do lemme know and i'll mail you photograph of it. 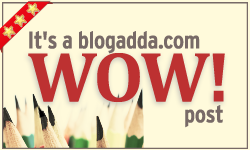 And Thanks Blogadda, for the opportunity to brush my sweet memoirs. Frank enmity is better than a doubtful friendship. Vision without action is merely a dream. Action without vision just passes the time. Vision with Action can change the world. - Joel Arthur Barker.